For the final leg of the South Africa to Kenya expedition, you will visit some of the most beautiful stretches of water in East Africa. Like the rest of the journey, always keep your eye out for wildlife as they will appear when you least expect it! A perfect combination of adventure and relaxation, Tanzania and Kenya offer the perfect climax to your trip. Plunging to depths of more than 700 metres, with the clear waters stretching out for around 365 miles Lake Malawi is quite simply vast. As an entirely landlocked body of water, the ecological system is self-contained and as such, has some important creatures within, such as the cichlids which are native to the Lake alone in many cases. Many animals and wildlife visit the lake with baboons, elephant, hippo and warthogs regularly wandering up for a spot of hydration. The size of the lake means there are many different landscapes surrounding it, with some areas dedicated to wildlife and others entirely given over to creating a beach-type area for people to relax and unwind. 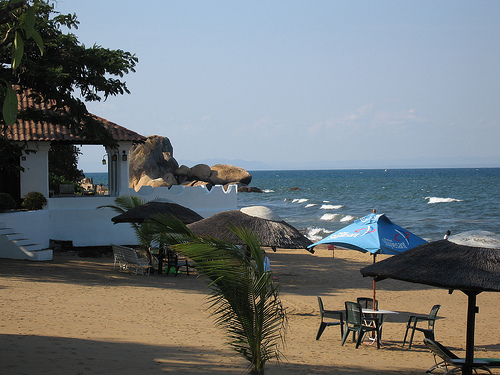 Kande Beach is a beautiful part of Lake Malawi with soft white sands, shallow waters and no rocks, making it perfectly suited to swimmers. There’s a waterside bar for refreshments, hammocks slung between trees for the ultimate in relaxation and gentle waves lapping at the shore. A quite simply idyllic rest before you are ready to hit the road again! Perched high above Lake Malawi on the Rift Valley Escarpment is the curious settlement of Livingstonia. Founded in the 19th century by Scottish missionaries, the town is one of the most picturesque in the whole of Africa. With stunning views over the landscape below, the panorama is quite simply breath-taking. On a clear day, the horizon seems to stretch out forever, with Lake Malawi far below and the Livingstone Mountains in Tanzania pointing up into the heavens. The town has a school house, a clock tower, a church, a scant few shops, a college and a hospital, all kitted out in a traditional Victorian English style. The unusual style and the unparalleled views make this little hamlet a fascinating place to see, almost a tiny patch of old England lost in the big wide continent of wild Africa. Just a 90 minute boat ride off the coast of Tanzania, Zanzibar is an exotic and mysterious island which played an important part in the old merchant spice trade. A vital trading point, the tiny island still grows and produces many spices today. It remains one of the very few places in the world where saffron is grown and visitors can purchase packets of spices to take away such as ginger, nutmeg, cardamom and cloves. There are many tours around the plantations and the sweet evocative scent of the spices is difficult to miss wherever you are on Zanzibar, but there is much more to see too. 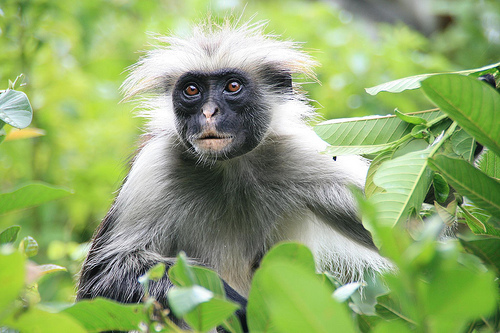 The Red Colobus monkeys which can be found in the forested area are nearly extinct but native to the island. Extremely friendly and playful, they will pose for snapshots but will also rummage through your bags given half a chance! One of the biggest cities in Tanzania, Dar es Salaam lies on the gentle Indian Ocean, offering travellers the chance to kick back and enjoy some sun, sea and sand before getting back on the road. Situated in a natural harbour, Dar es Salaam offers a melting pot of culture with Swahili roots combining with Arab, Indian and Asian influences. 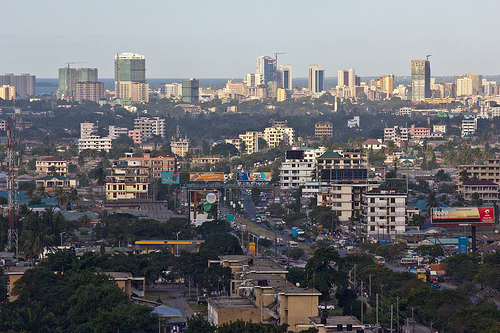 The city itself is bustling and busy but some visitors suggest that the best restaurants in East Africa are found in Dar es Salaam. You will find a mix of cuisines to suit all palates and budgets, with a diverse range of accommodation available too. But it’s at the seafront where the city really stands out, providing high class facilities to relax and lounge around in, with tranquil and visually stunning surroundings to match. With pure white sands, and crystal clear blue waters, it’s a tropical paradise waiting to be discovered. The savannah and plains which Kenya is most famous for, ‘Masai’ refers to the people and ‘Mara’ technically refers to the land itself. Renowned for the wildebeest migration which sees millions of hoofs taking to the plains, the Masai Mara is filled with wildlife all year round. All of the Big Five can be found on the savannah, and has one of the greatest concentrations of lions that can be found anywhere. Buffalo, leopard, cheetah, giraffe, elephant and zebra are just some of the wildlife that can be seen out on a safari. Of course, part of the attraction is the Masai tribe too, willowy and tall and with an instantly recognisable dress. During your time camping out near the Masai Mara, you might be lucky enough to see tribesmen striding across the bush, a sight not many people are privileged enough to experience first-hand. Located just outside Nairobi, the Langata Giraffe Centre was originally set up as a breeding centre but now acts as a base for conservation and education. The giraffes come right up to the visitors and there’s even an elevated feeding platform where people can see face to face with the tall animals for the very first time. Hand feeding a giraffe is a revelation, discovering how they use their prehensile tongue to strip leaves from bushes and avoid prickly thorns. At Langata the giraffes are free to wander all over the garden and often approach the house too. It’s not unusual to be relaxing over breakfast only to be joined by a giraffe thrusting its head through an open door or window! A beautiful colonial guest house completes the complex, but the real beauty of the location is the way in which the giraffes’ welfare is always put at the top of the agenda. If you have enjoyed your expedition and want to see more of Africa, you could opt for one of the other tours around the region . The Nairobi to Cairo tour starts in Kenya and snakes through Ethiopia and Sudan before finishing in Egypt. Of course, one of the joys about visiting Africa is that no two visits will ever be the same, even if you visit the same locations. The people you meet along the way and the wild life that you encounter make each experience entirely unique. If you want to repeat this expedition but with a slight twist, you could opt to travel it in reverse, starting in Kenya <LINK TO #2> before moving on to see the gorillas in Uganda. Whether you come back to Africa soon or in the distant future, you can be sure that the friendships that arose during your expedition will last just as long as the many photographs and memories you made too.